The last two weeks have been busy getting ready for Christmas... baking, shopping (ugh! I hate malls! 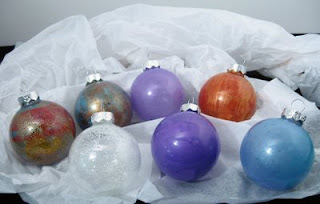 ), finishing up projects, wrapping gifts, putting up the tree... and getting some art time in. Last week, Kim Parkinson held a workshop over on Latest Trends working with metal foil. Well, I have been waiting for what seems like forever, to do this workshop with her. 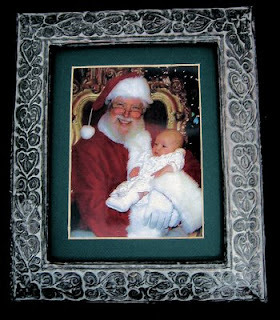 Her project was a holiday card box but I decided to do a frame for one of my favourite photos of our granddaughter with Santa when she was just a few months old. I had an old frame I didn't like and it was perfect for the project. I created the pattern on my computer and then got to town doing the metal work. Once the pattern was completed, I flipped it over, did some refining, flipped it back over, put Spackle on the back to give it body and let it dry overnight. I had planned on painting it but when I did, I sure didn't like it! It wasn't my vision of what I wanted at all. 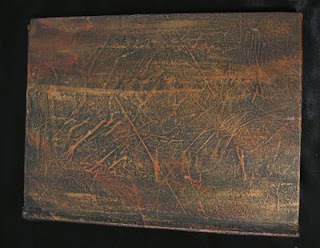 I messed around with some more paint, even took some sandpaper to it and it looked even worse. I was already tearing my hair out and about to kick myself in the derriere when ***bing*** I had an idea. I'd just make it look like old pewter. Well I didn't have a clue as to how that was going to happen, but in the end it did. I am pretty pleased with the results. Well now I was right "into" doing metal. "More, more", said my muse! Never being one to deny my muse ANYTHING (chuckle), I whipped out some more metal and made two more pieces. 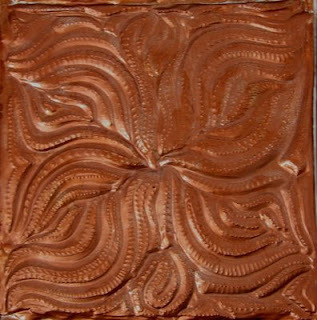 The first one is a pattern mold for printing on fabric using Shiva oil sticks. The second is a foam stamp I had. 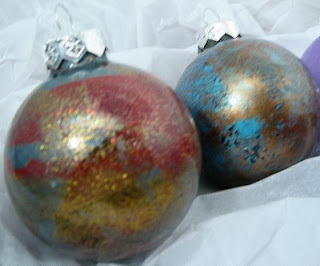 I coloured both of these with alcohol ink... what a pleasure it was to work with that stuff... thank you Tim Holtz! So now what? Some nice metal pieces but what can I put them on? Oh, I know, I'll put them on a book cover. Hmmm... haven't got one that's big enough! Oh gosh, I guess I'll just have to take one of those old encyclopedia books and make a cover. Out came the matte medium and old pattern tissue paper. Slap, swish, slop... nice texture! When it was dry, I brushed it with Lumiere (my favourite metallic acrylics) and here is the result..
Of course, I haven't got the pages for the book bound yet... that's going to have to wait until after Christmas now... but it's going to look pretty darn nice when it's finished! 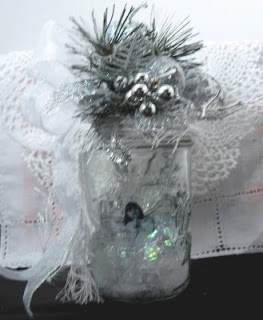 Another project I started and got finished was a fairy jar! This is not normally something I would tackle but it was a gift for a swap friend who loves faeries. I couldn't find any instructions on how to do this so I just figured it out myself. Unfortunately because it is all white and silver it doesn't photograph all that well, but it turned out quite sweet. Even hubby liked it....and that's saying something .. don't ya think?? Here's a close up of the little angel inside. I made her wings out of a drawing that I scanned into the computer and then printed on a transparency. Nope, not done yet... told you... I was a busy gal this week... I wasn't kidding! Next project... a paper sculpture! And yes, you guessed right... one of those Reader's Digest Condensed Books is now a very elegant paper sculpture! This photo really doesn't do it justice... the paper is a wonderful vintage shade of ivory going into brown. Terry Noell, the paper sculpture maven extraordinaire, really inspired me to take a crack at doing a sculpture after watching her photo show. It was fun... after awhile folding the paper becomes a very zen like activity! This sculpture reminds me of an Elizabethan collar... what does it look like to you? When I was photographing the sculpture, I happened to look at it from above. I was fascinated by how it looked! Isn't this photo, taken from above, neat??? 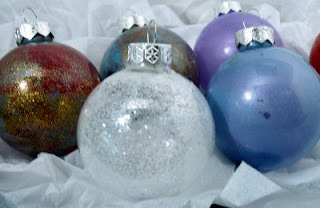 We're into the home stretch now... with the clear glass Christmas balls that had a date with some of my Lumiere paint, some perfect pearls, mica, glitter, "snow", spray adhesive and alcohol blending fluid. Susan Chong, one of our art Mom's over at Art Techniques just had to go and make some of these just as I was about to clean up my art room! Of course, when I saw hers, I just had to have some too! She has some instructions on her blog if you just have to have some too! I didn't quite follow her "recipes" (remember, I am the one who never follows instructions) but I think they turned out nicely, don't you? I doubt that I can stay away from creating more "stuff" in the next couple of weeks so tune in next week to see what I have been up to! I am sure to find a few little bits and bobs hiding underneath all the stuff on my art table as I am cleaning up that just beg to become a little project! Thanks for stopping by... hope you enjoyed this week's show and tell. May it inspire you to make a mess in your art room too! Just be naughty... Santa will forgive you if your art room is not pristine! Your metal foil efforts are fantastic. You have inspired me to give it a go - off to download the instructions from the files now! Love all your other show and tell items too, brilliant. LOVE love love the metal work!!! Love it! The frame is gorgeous! It looks like real pewter, great job! I'm so glad you liked working with the metal. Love the way your frame turned out. If you like the pewter look, you really have to try tooling real pewter foil. LOL It is yummy to work with. Much easier to tool and you can get beautiful flowing lines. Great frame. 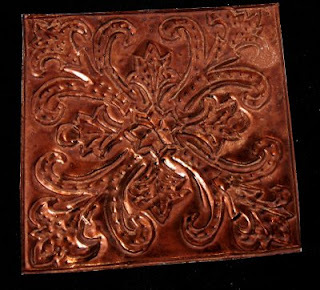 I also took a class with Kim learning the basics of metal embossing. She's a great teacher! Now I just need to practice everything she showed me. Sharon the frame is just amazing. I would never have guessed that was a first time attempt either. None of my Christmas things are complete yet, everything is in partial stages. See all of your wonderful things nicely finished I'm inspired! 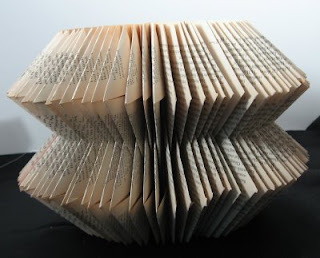 Sharon, will you share your method for the folded book sculpture. I've got an old RD condensed book that I have been waiting for inspiration to do something with - I love what you've done. Sharon, I am just amazed at how much you actually manage to get done in the limited amount of time you must have! I always look at your blog with great interest and you have really outdone yourself this time. 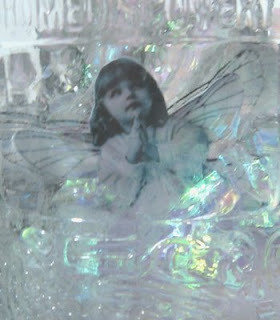 The fairy jar came out very well, very ethereal, very atmospheric. I only got as far as buying some polystyrene balls (still in the bag... they were going to be snowmen). 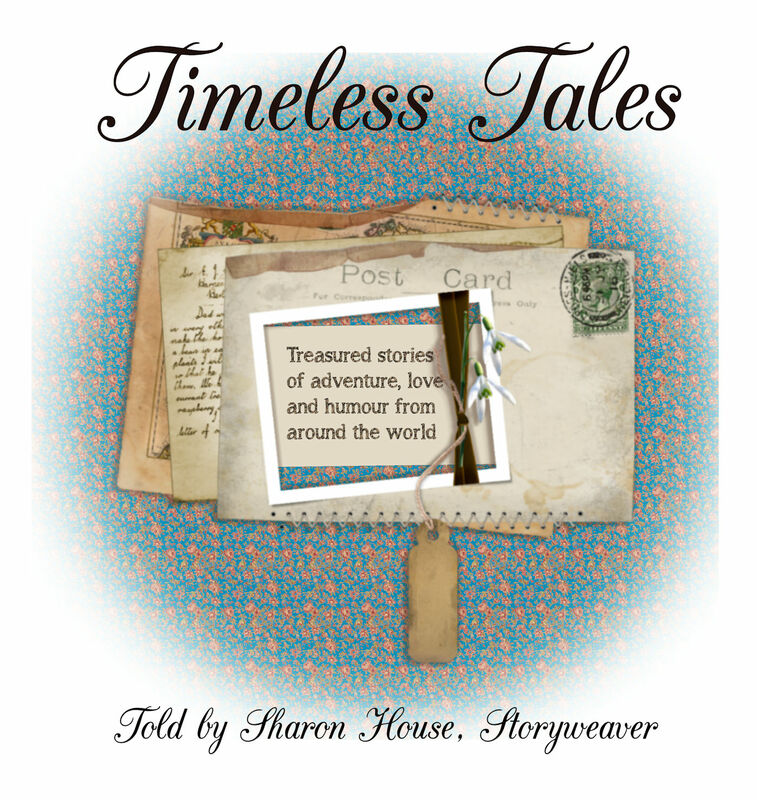 And thanks so much for your comments on my blog too! Happy Holidays.